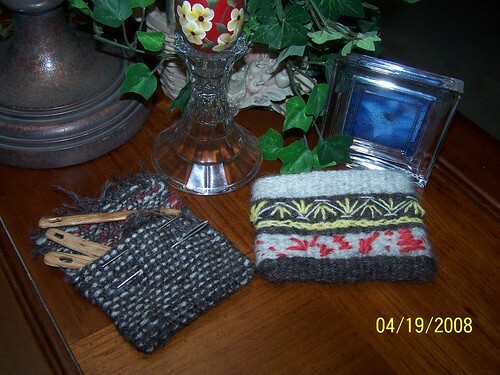 Posted on April 19, 2008	by Linda S.
to keep this pouch made of only my handspun and handwoven yarns… may not be totally possible, especially since I am considering a zipper closure..
Anyway…on to the woven pouches.. 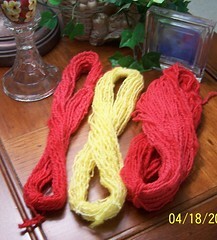 The fabric when removed from the loom was about 4 inches wide. The side seams leave the pouch 3 1/2 inches wide. I thought perhaps I would use it for my nalbinding needles and tapestry needles…but it really is too small. They may have to move on to the larger pouch, but I like the idea of the fold over the top, so I may just have to make another one in a larger size. This entry was posted in Crafts, Embroidery, Fiber Preparation, Handcraft, Handwork, Historical Textile, Naalbinding, Needlework, Spindling, Spinning, Weaving. Bookmark the permalink. Jealous of your weaving progress! 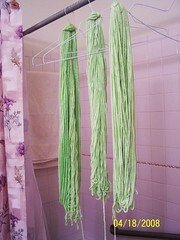 someday I’ll have time to take the plunge, but I’ve been travelling too much lately to consider taking up a new craft.